Some colors are so exquisite for festive occasion. Navy blue is one such. This deep shade is drop dead gorgeous on Indian ethnic wear. Take a look on your wadrobe, you would have handful of them in your party wear section. That memorable silk saree, majestic anarkali all might be staring at you in pretty deep shade of navy blue. Needless to say, if you don’t have one, then you need to invest on this hue. Because it is a highly versatile shade, and would suit Indian women of any skin tone. It also enhances any heavy work that your outfit carries. And it photographs exceptionally well. 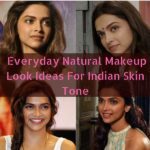 With tons of benefits that come along with navy blue dresses, it is very ideal time to reflect on all the possible makeup you can do to extend its beauty. If you are still searching for an alluring makeup look, then we have something for you today. Recently we spotted Pooja hedge wearing a regal navy blue lehenga suit with even more charming makeup. It will leave you to want more outfit of this shade immediately. We mean it! For this enthralling lehenga ensemble, Pooja opted for a voluminous pony tail. Makeup wise, things were kept simple, yet catchy to the point. Blue smokey eyes and pink lips elevated her facial features. A right placement of blush and highlighter gave final strokes to her bright makeup look. That’s it and she is done to look so splendid in this desi look. We are apparently drooling over this simple, yet enchanting look. This pretty makeup is not just for lehenga, but can go well with sarees, anarkalis and even for your salwars too. It’s time to take notes and keep it safe, so you know where to look when you want a makeup idea for your navy blue dresses. If you like to recreate similar eye makeup, then we advise you to take a look on this tutorial. 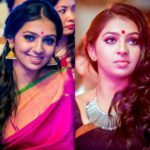 Really Your Makeup Art is very very Nice and thanks for giving tips for Unique Bridal Makeup on Blue Lehenga and saree. Wow, You just look awesome, thank for really nice tips, i’ll surely try these in my wedding.